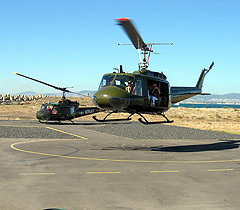 Combat Flying - Experience the exhilaration of flying in an ex Vietnam US Marine Corps Huey Helicopter. All doors stay open during the simulated attack flying trip adding to your adrenalin rush. The most widely used military helicopter, the Bell UH-1 series Iroquois, better known as the "Huey", began arriving in Vietnam in 1963. Before the end of the conflict, more than 5,000 of these versatile aircraft were introduced into Southeast Asia. 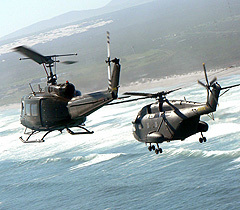 "Hueys" were used for MedEvac, command and control, air assault, to transport personnel and material and as gun ships. 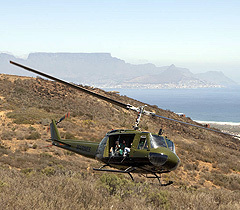 Considered to be the most widely used helicopter in the world, with more than 9,000 produced from the 1950s to the present, the Huey is flown today by about 40 countries. Two Oceans Tour: Waterfront – Clifton – Camps Bay – Hout Bay – Noordhoek – Fish Hoek – Muizenberg – Constantia - Table Mountain – City Bowl – Waterfront. Full Peninsula Tour: Waterfront – Clifton – Camps Bay – Hout Bay – Noordhoek – Kommetjie – Scarborough – Cape Point – Simonstown – Fish Hoek – Muizenberg – Constantia – Table Mountain – City Bowl – Waterfront.